I only cook the OPOS (One Pot One Shot) way everyday. I am constantly thinking of the layers and its almost an auto reflex to think of any recipe in terms of OPOS. Ever since I was introduced to this way of cooking, the variety of food at home has increased manifold. Things like Biriyani, Brinji, Vadakari, Kothu Paratha, Idiappam, Appam, Stew, Kuruma, Salan, etc have become regular fare and eating out has been reduced to just local specialities once in a while. I store fewer vegetables (which irritates Amma :):)) and we eat a lot more fresh food. 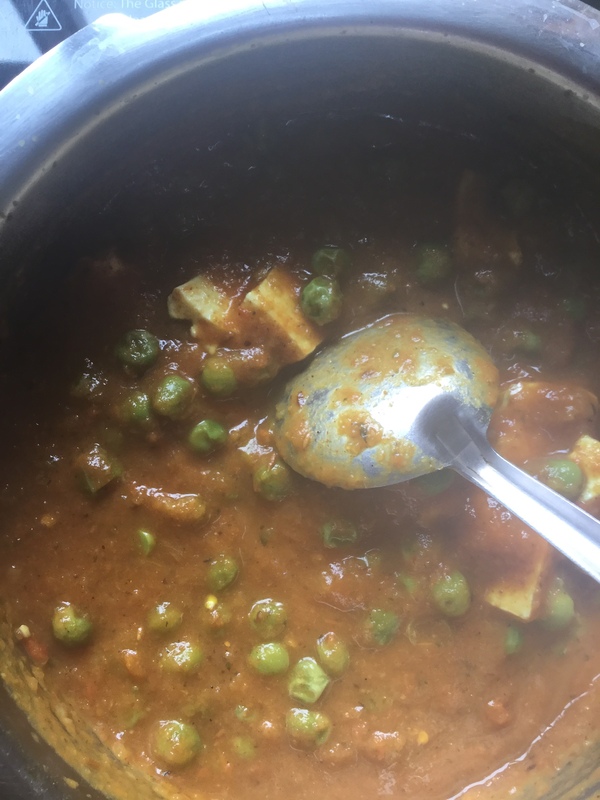 And the end result is creamy Matar Paneer ! 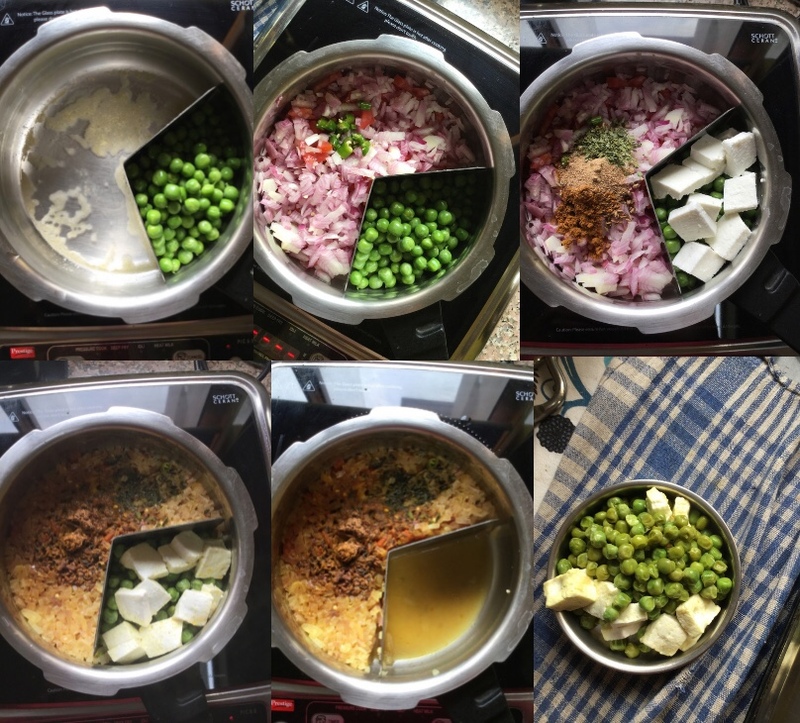 Most importantly – I didn’t put the Palak or Paneer into the fridge !! It was received in the morning and by the afternoon, it was all used up. The quantities were just enough for the three of us for one meal, so no storage of leftovers either. I actually miss Appa every time I do this, he would have taken to OPOS instantly and enjoyed eating a variety of food items. How much time ? Under 4 mins for each – Palak and Matar Paneer. Infact I made both of them just as we were about to sit down for breakfast and lunch, so no reheating was required ! Yet another advantage. When we get friends over for a meal nowadays, I only do the prep of cutting veggies and soaking rice etc. I start cooking 30 mins ahead of when they are ready to eat and it works out just fine. Since the dining table is in the kitchen, most of the time, our friends come over and sit down and get served straight from the cooker and all my pretty bowls end up being unused. Now that is sad but then, what is more important – how pretty the bowl is or how tasty the food is ? You too can join the revolution and cook the OPOS way.